Magnetic, alluring, spellbinding and deliciously fake, Anne Zahalka’s ‘Nicole Kidman 2007’ casts an eerily familiar gaze at the viewer. This iconic look, circulating on a daily basis in mass media, is so ubiquitous that we take it for granted: only a startling moment later do we realize that it actually belongs to a wax statue cast in 2007 for Madame Tussaud’s museum in Hollywood. Part of the series ‘The immortals’, this detailed ‘portrait’ attains its pull thanks to the saturated colour scheme of reds and blacks, while the dazzling spotlight and presentation allow the figure to radiate. All of these characteristics are common to religious painting, portraits of royalty, advertising lightboxes and Hollywood posters to which the artist often refers as a means of decoding popular modes of representation. 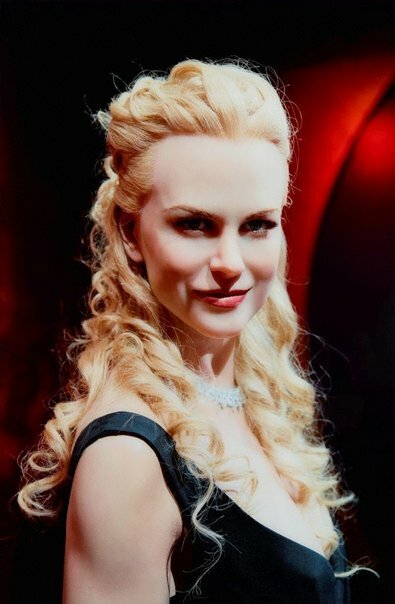 Ultimately ‘Nicole Kidman 2007’ has nothing to do with Nicole Kidman. This luminously glowing effigy is more an embodiment of society’s mythmaking processes and a projection of contemporary culture’s insatiable desire to create hypereal images that devour reality itself. Isobel Parker Philip, Look , 'Extremely loud and incredibly close', pg.24-26, Sydney, Apr 2015, 24 (colour illus. ).